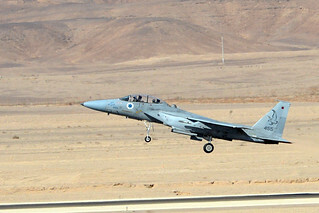 Blue Flag 2013 is a multi-national aerial combat exercise with participation of the air forces of the U.S., Israel, Italy, and Greece held for the first time at the Ovda air base in southern Israel. Ambassador Dan Shapiro was the guest of the Israeli Air Force and the 492d Fighter Squadron that flew over their F-15E Strike Eagles from RAF Lakenheath in England. Ambassador Shapiro met the American men and women charged with operating and maintaining the airplanes, received briefings from Israeli and American commanders, and watched a stunning display of F-15’s, F-16’s, Tornadoes, and AMX fighter jets taking to the skies. Blue Flag signifies the strong defense cooperation between the U.S. and Israel, as well as with its other allies.